Goalkeeper Boniface Oluoch’s heroics lifted Gor Mahia into the first round of the CAF Champions League as they won 4-3 on penalties against Malawi’s Nyasa Big Bullets on Wednesday. Oluoch made a crucial save from the penalty spot in the 87th minute of the match when Gor were trailing 1-0 and he went on to make another stop in the shoot-out. Nyasa had scored the opener in the 55th minute to take the aggregate scores to 1-1. Had they scored their 87th minute penalty, then more or less it would have been game over for K’Ogalo as they would have bowed out 2-1 on aggregate. The home side was handed a penalty late in the game after left back Shafik Batambuze handled the ball inside the box in an attempt to control it. However, Oluoch came to his rescue. In the shoot-out, Chiukepo Msowoya made amends for his earlier miss scoring Nyasa’s first take with Bernard Ondiek responding for Gor. 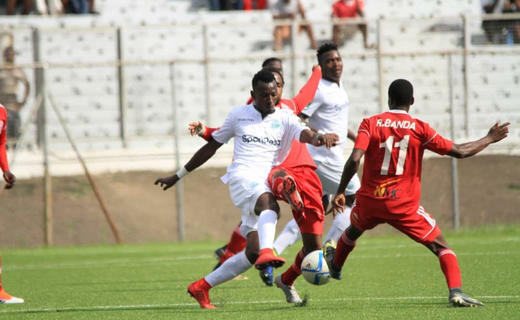 Nyasa found themselves chasing the game when Miracle Gabeya’s kick was saved and Gor responded with Humphrey Mieno, Boniface Omondi and skipper Harun Shakava converting. John Lanjesi and Yamikani Fodya scored for Nyasa to take the ties to 4-3 with one round left for each. Pressure was left on Philirani Zonda to score Nyasa’s fifth and keep the home side’s hopes alive, but he rattled the bar and Gor didn’t even need to step up for their fifth. In regulation time, both teams had chances with Gor almost going to the break 1-0 up, but Harun Shakava’s tap from a Shafik Batambuze freekick came off the upright. In the second half, the home side stepped up their intensity and they were 1-0 up after 55 minutes when Msowoya struck a superb volley from distance catching keeper Oluoch off his guard. Gor should have responded quarter of an hour later when an inviting cross from Samuel Onyango found an onrushing Erisa Ssekisambu, but the Ugandan’s header at point blank went over. Nyasa should have won the game in the 87th minute when they were handed a penalty after Batambuze handled inside the box, but Msowoya took a lazy kick that ended up safely in Oluoch’s arms.